Pictured (from left): Phillip and Audra Bowman. 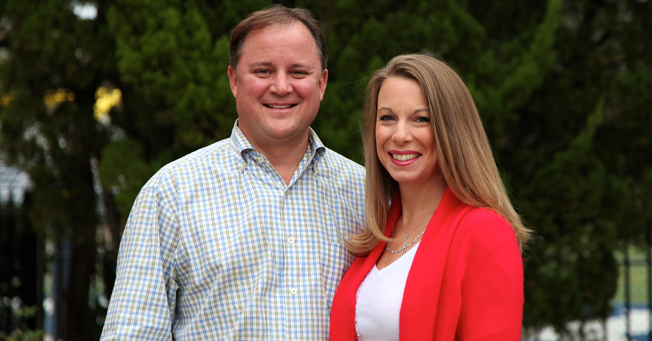 Jackson Academy seniors pursuing a business degree at Ole Miss have the opportunity to apply for a generous scholarship thanks to the generosity of JA Trustee and alumnus, Phillip Bowman ’86, and his wife, Audra. The Phillip and Audra Bowman Ole Miss First Scholarship in Business provides annual tuition assistance and funds for the student to participate in the Ole Miss First Leadership-Mentorship Program. The selected recipient will be eligible to retain the scholarship each year as long as the student maintains a 3.0 cumulative grade-point average and participates in program offerings. Phillip is a 1986 JA graduate and was the first alumnus to serve as JA Board of Trustee Chairman. Audra has served in numerous volunteer roles at JA. They are the parents of Blaine, Wesley, and Amelia Dare. The scholarship was first awarded in 2011 to a JA student, Bowen Thigpen ’11.